Angela Ferguson and her daughter take a trip to a verdant oasis in the heart of Chester – Grosvenor Park – to experience the summer spectacle that is Grosvenor Park Open Air Theatre. Photos: Mark Carline and Angela Ferguson. It’s the perfect weather for a stroll through our oh so photogenic city. The sun is virtually cracking the flags – or should we say cobbles, at least in parts of our historic city – as my daughter and I wander over to Grosvenor Park Open Air Theatre. We pass the amphitheatre, packed with fascinated tourists wielding all manner of fancy cameras, before reaching historic St John the Baptist’s Church en route to what is one of our favourite spots in Chester – Grosvenor Park. Maybe it’s because I am not getting any younger, but I can’t quite believe it’s that time of year again, when the park is given a dazzlingly theatrical new summer look as it plays host to the open air theatre in the round. Pass the prosecco – or in this case the fizzy orange – it’s time to take our seats in this sunkissed theatre of dreams. And full credit to the Storyhouse team – there’s a warm welcome and the front of house team even supply sun cream and cups of water to help protect against the scorching heat of the midday sun. They really do seem to think of everything. And whether it’s a daytime trip or a visit later in the day to soak up the vibes of a balmy summer’s evening in our beautiful city, we never fail to come away feeling inspired and uplifted, with lifelong memories made. This time round is no exception as we’re ready to set sail for a swashbuckling adventure on Wild Cat Island, courtesy of the cast of this magical adaptation of Arthur Ransome’s classic tale. For us, one of the stand out performances has got to be Mitesh Soni as the rather innocent and adorable Roger from the Swallows, with his beautifully childlike expression, such as when he exclaims “we digged it up!”. We don’t want to go down the spoiler route but the learning to swim scene is just glorious. The director Katie Posner makes excellent use of this theatre in the round, with creative use of props such as majestic oars and aquatically-enhanced wheelbarrows. You’ll know just what we mean if you come along to watch this feast for all of the senses. As is traditional with open air theatre performances staged by Storyhouse, there are also some fantastically quirky musical instruments underscoring the production, with some enchanting harmonies from the multi-talented cast. Another stand out performance for us is from Ian Harris as the uber stressy nurse to the Walker family, with writer Bryony Lavery adeptly bringing to the fore the silent support aspect of this classic tale of childhood adventure, offering light and shade to the calmer and more laid back tones of the children’s mother (Laura Dalgleish). We also love the feisty and confident performance from Claudia Grant as one of the Swallows, Tatty, along with the exuberant performance from Aryana Ramkhalawon as the definitely not to be trifled with Amazon, Nancy. Mention must also be made of the marvellously magical puppets created by Matt Hutchinson, giving the story an extra dimension in capturing the hearts and minds of the audience. There is also plenty of audience interaction and engagement in this rip-roaring adventure. It is theatre at its best, drawing in the audience and carrying them on a wave of anticipation of adventures to come. And, who knows, maybe this production will inspire any number of future adventures from its enthusiastic audience – whether young or old. There’s certainly some food for thought here when it comes to our tendency to perhaps over protect our children at times, speaking as a parent sometimes guilty of this myself. This modern-day take on parenting is oceans away from the rather extreme freedom experienced by the children in this story. All in all, this is an enchanting and uplifting production, breathing new life into a classic book. 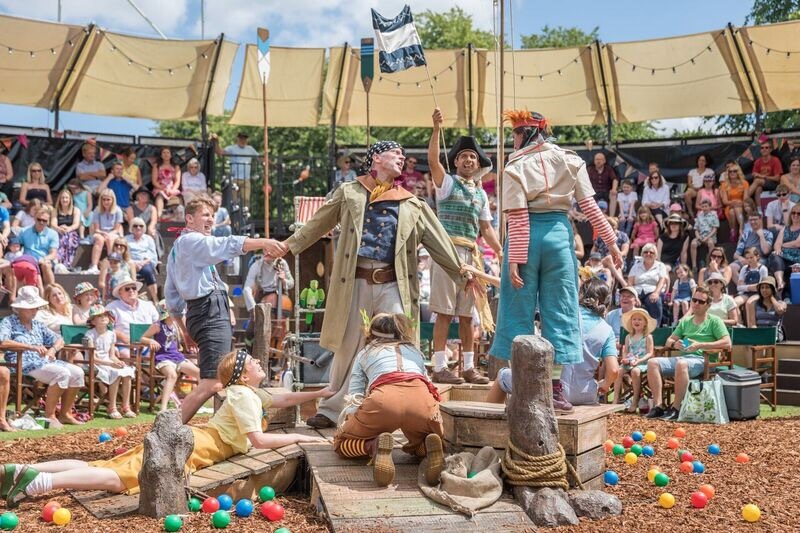 We all need more adventure in our lives, so if you get the opportunity then we strongly suggest you set sail for Grosvenor Park Open Air Theatre before you miss the boat.